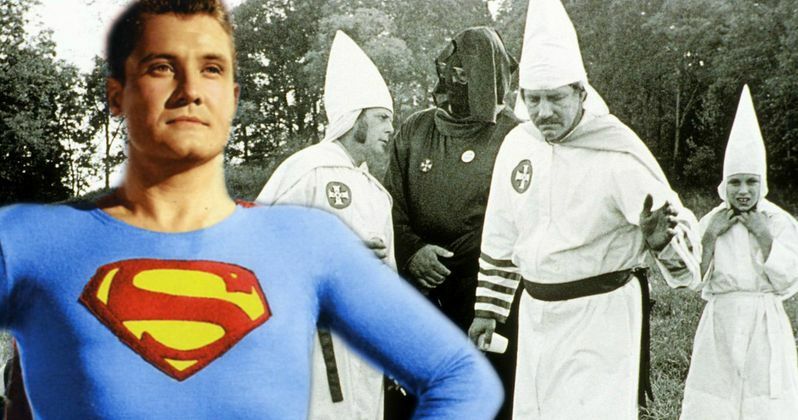 Get ready to see perhaps the most bizarre Superman movie you are ever going to see, because the Man of Steel is getting ready to fight the KKK on the big screen. Lotus Entertainment and PaperChase Films have officially partnered to make Superman vs. the KKK. Yes, this is really happening. But don't worry, this isn't something that will be connected to the Warner Bros. DC Extended Universe. This will very much be its own thing. According to Deadline, Superman Vs. the KKK will be adapting Rick Bowers' 2012 novel, Superman Versus The Ku Klux Klan: The True Story of How the Iconic Superhero Battled the Men of Hate. The book chronicles the real-life story of a 1946 radio drama that pitted Superman against the KKK. The play was originally performed over several episodes during the Adventures of Superman radio drama, which led to the Klan officially denouncing the show. Here is what Lotus Entertainment's Bill Johnson had to say about it. "The themes of this true story fall right in line with the type of stories that inspired me to want to make movies in the first place. We're delighted to be partnering with PaperChase and are looking forward to a successful and enjoyable collaboration on this film with hopefully more to come in the future." Just to clarify, this movie will not actually be a live-action or animated version of Superman actually taking on the KKK. Instead, Superman vs. the KKK will chronicle a former Klan member who goes undercover in 1946 and works with the Anti-Defamation League and the producer of the Superman radio show. With his insider knowledge of the KKK, he was able to make the radio play possible and authentic, while also revealing the actual inner workings of the organization. The real man responsible, Stetson Kennedy, was even able to provide the producers of the radio play with code words, rituals and recruiting tactics that the KKK used. Producer Marco Vicini had this to say about the movie. "The story behind 'Superman vs. the KKK' really struck a chord with me. Right away I knew I wanted to re-live it by being a part of the nonviolent resistance against oppression. It is a great honor to be able to embark on such a relevant and meaningful project with such a devoted and highly experienced team of like-minded individuals." "It's both rare and vital to have the opportunity to align with a company like Lotus, where the creative vision matches the raw determination to bring exciting, commercially viable content to the marketplace. When presented with SUPERMAN VS KKK, we immediately knew we were working with a group who understand the importance of delivering profound and impactful cinematic experiences that resonate with audiences around the world." There is no word yet on an anticipated release date for Superman vs. the KKK and no director has been attached. However, it is said that this movie is being adapted for general audiences, so it seems like they are going for a mass appeal angle. Katherine Lindberg has been brought on board to adapt the book for the big screen. It is also unclear at the moment if the studios will aim for a major theatrical release of Superman vs. the KKK, or if it will wind up being a smaller project that could wind up mostly on VOD or a streaming service like Netflix. Either way, the title alone should garner plenty of attention for the project.